The European Union (EU) and the United Nations' nuclear agency have reaffirmed their support for the 2015 nuclear agreement between Iran and six other countries. Media outlets reported on Friday that the two sides had communicated the stance in a joint statement a day earlier following the fifth meeting of their senior officials. The deal, officially titled the Joint Comprehensive Plan of Action (JCPOA), was reached after hard diplomatic work by the Islamic Republic and the P5+1 group of countries, comprising the US, the UK, France, Russia, China, and Germany. Under the accord, all nuclear-related sanctions on Iran were terminated, and Iran in return agreed to apply certain limits to its nuclear program and provide enhanced access to international monitors to its nuclear facilities. In their joint statement, the EU and the International Atomic Energy Agency (IAEA) "reaffirmed support for the JCPOA based on their respective mandates," the joint release read, detailing the outcome of the EU-IAEA summit. 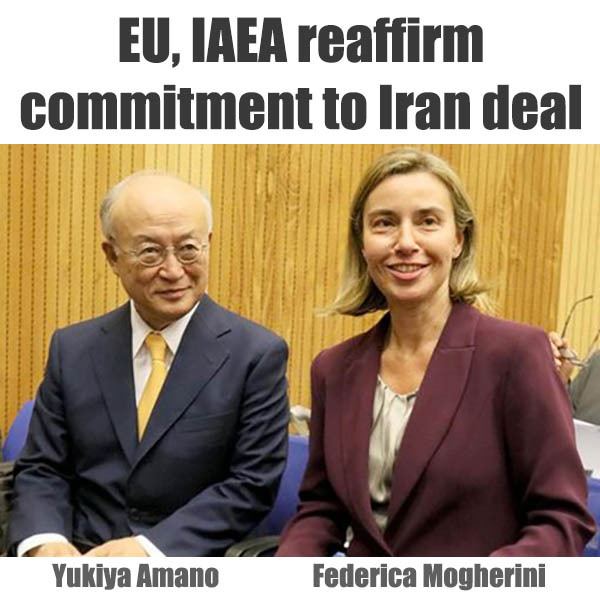 EU foreign policy chief Federica Mogherini "will remain in close contact with the IAEA regarding continued implementation of the agreement" in her capacity as coordinator of the Joint Commission established under the JCPOA, the statement added. The Commission, which brings together representatives of the parties to the agreement, is tasked with monitoring its implementation. "The EU will provide technical support to the IAEA such as equipment and training," the statement further read. "The EU also informed about its bilateral cooperation with Iran in implementation of Annex III of the JCPOA, particularly in the area of nuclear safety including research," the statement concluded. Annex III addresses the issue of civil nuclear cooperation. Mogherini on Friday separately stressed the importance of the nuclear deal, saying it was "delivering on its objectives" and underlined the need for "a full and effective implementation by all sides throughout the lifetime of the agreement." Such assertions by the EU and the IAEA are in contrast with the bellicose rhetoric of the administration of US President Donald Trump toward the accord. Trump has called the deal "the worst accord ever" and "one of the dumbest" ones he has come across.